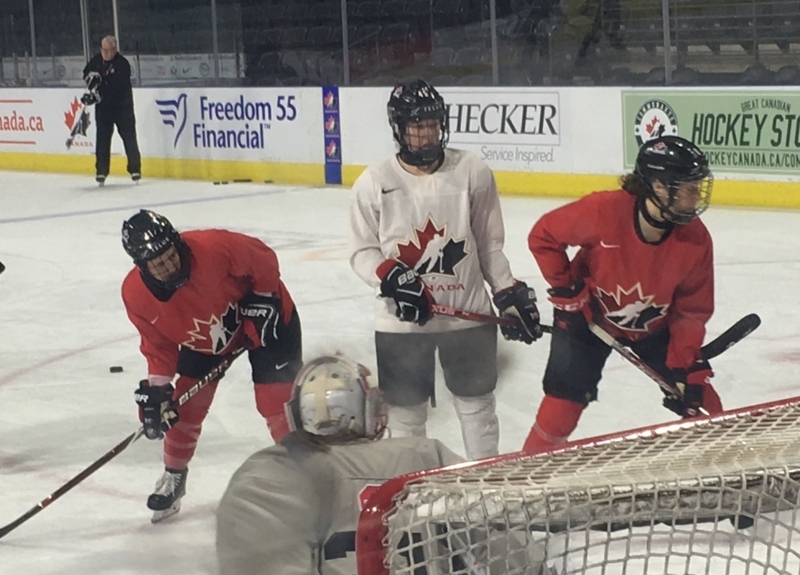 Pair relishing chance to play before home crowd versus U.S.
At the end of the morning skate Tuesday, Katelyn Gosling and Brittany Howard shared a laugh, and soaked in the moment. The pair are teammates for Canada in the Women's Rivalry Series, which begins Tuesday night at Budweiser Gardens. Canada squares off against the U.S.
“I had to take a second to realize how exciting this is,” says Gosling, who plays professionally in Calgary. The Londoner will be joined in the game by her former junior teammate, Brittany Howard. Just hours before making her national team debut, the St. Thomas native was pretty pumped. “There is some nerves and it will be surreal when game time gets here,” says the 23-year-old Howard, who plays for Toronto in the CWHL. The stands will be packed with young female hockey fans, including 1,200 from the London Devillettes organization. “Five, six years ago, if you said a female hockey game would be sold out, Bud Gardens people might think you were crazy,” says London Devillettes executive Steve Milne. “It's a testament to what we have done in the community as far as becoming an elite centre in the community for females”. Milne adds that Tuesday's game will be special because a lot of the girls and women in the crowd have been following Katelyn and Brittany through university and now the pros. And Katelyn is a bit jealous of those fans because she never got to watch Canada and the U.S. play live. “It’s going to be very special. I would have loved to watch a few games here, and they are fortunate to have that. I was once there in their shoes and now it's so exciting to be here."